Web content writing requires a different approach then content writing for print documents and publications. Web content writing is nowhere close to the offline world. Web users typically don’t read web content word for word but instead they scan the page, picking out certain words and sentences. Scanning text is an extremely common behavior for higher-literacy users according to recent eyetracking studies that had 232 users looked at thousands of Web pages. They found that users’ main reading behavior was fairly consistent across many different sites and tasks. 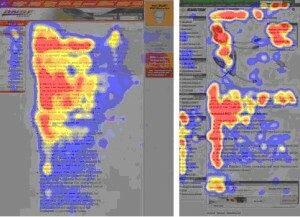 Heatmaps from user eyetracking studies. The areas where users looked the most are colored red; the yellow areas indicate fewer views, followed by the least-viewed blue areas. Gray areas didn’t attract any fixations. Users won’t read text thoroughly in a word-by-word manner. Exhaustive reading is rare, especially when prospective customers are looking for certain products/services. Some people will read more then others but they will rarely read the entire site content. The first two paragraphs must state the most important information. The heatmaps showed that users will actually read this material, though they’ll read more of the first paragraph than the second. If the first two paragraphs don’t have what users are looking for, they will leave. Start subheads, paragraphs, and bullet points with information-carrying words that users will notice. Bullets are one of the most favorable online elements; they are suited perfectly for the task of highlighting the most important content on a page. Bullets are easy to read, scanner friendly, and pass important information in short bursts so user don’t feel overwhelmed. Looking at the study it is clear that web content writing focusing on high view areas will increase usability rate, improve visitor retention, and increase sells. Having the first two paragraphs in getting to the point and passing the benefits in a scanable web content format is the key in getting user to stay and navigate to other parts of your website. You have a business that you are excited about. A business that you know will make your customer’s lives easier. However, you can’t seem to convert business through your website. Determining why your website is ineffective in converting business has been perplexing; your site clearly explains why your business is the best. 1. Keep it pithy - Visitors don’t want to wade through paragraphs and paragraphs of words. They want to know right away what they want to know. Give them the information they need off the top in a concise sentence. 2. Shorter is better – Short sentences, short paragraphs, and short words. Short and sweet wins the web content race. 3. Enough about you, talk about your customers - Selfishness rules the day when customers are searching for a service. They don’t care about you, they care about themselves. Therefore, it makes sense to tailor your writing toward what your customer is looking for and why you can help them. 4. Objectivity – You may think your service is the greatest out there, but why should someone browsing the web believe you? Using the previous three tips, explain what your product will do for the customer. Revising your website content so that it is focused on your customers, is easily digestible for impatient viewers, and touts the benefits of your product or service will transform your website into a valuable business generation tool.